Offers a revealing look into the hidden workings of the Holy Spirit in the human soul's inner depths. This unique book offers a detailed and revealing look into the hidden workings of the Holy Spirit in the human soul's inner depths. Read slowly and thoughtfully, this book elevates the mind, offering what is, for most of us, a new vision of our evolving life in Christ, and Christ in us. 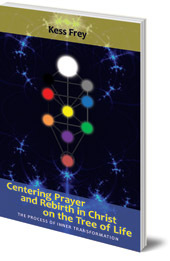 The essence of Centering Prayer is consenting to God’s presence and action in us and in our life. The work of the Spirit aims to bring us into the fulfillment of our true self as a spiritual being. The resultant growing freedom to consent becomes cause for increasing peace and joy in the soul. This is a gift of divine love that brings us step by step into the fullness of our life in Christ -- which is a continuing rebirth into the limitless light, life, and love of the divine consciousness. Kess Frey was born in 1945 and grew up in California. He met Thomas Keating in 1989 and has been involved with the Centering Prayer movement ever since. He lives in Anchorage, Alaska, where he offers introductory Centering Prayer workshops, facilitates prayer groups and retreats, and is active in prison ministry.